Extreme value notes | Brainder. 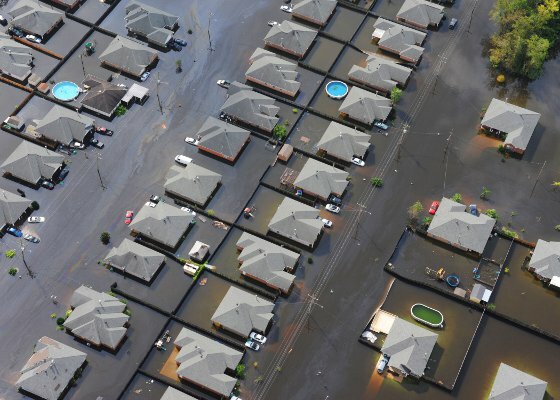 Extreme values are useful to quantify the risk of catastrophic floods, and much more. This is a brief set of notes with an introduction to extreme value theory. For reviews, see Leadbetter et al (1983) and David and Huser (2015) [references at the end]. Also of some (historical) interest might be the classical book by Gumbel (1958). Let be a sequence of independent and identically distributed variables with cumulative distribution function (cdf) and let denote the maximum. The distribution function might, however, not be known. If data are available, it can be estimated, although small errors on the estimation of can lead to large errors concerning the extreme values. Instead, an asymptotic result is given by the extremal types theorem, also known as Fisher-Tippett-Gnedenko Theorem, First Theorem of Extreme Values, or extreme value trinity theorem (called under the last name by Picklands III, 1975). Type I (Gumbel law): , for indicating that the distribution of has an exponential tail. Type II (Fréchet law): indicating that the distribution of has a heavy tail (including polynomial decay). Type III (Weibull law): indicating that the distribution of has a light tail with finite upper bound. Note that in the above formulation, the Weibull is reversed so that the distribution has an upper bound, as opposed to a lower one as in the Weibull distribution. Also, the parameterisation is slightly different than the one usually adopted for the Weibull distribution. These three families have parameters , and, for families II and III, . To which of the three a particular is attracted is determined by the behaviour of the tail of of the distribution for large . Thus, we can infer about the asymptotic properties of the maximum while having only a limited knowledge of the properties of . These three limiting cases are collectively termed extreme value distributions. Types II and III were identified by Fréchet (1927), whereas type I was found by Fisher and Tippett (1928). In his work, Fréchet used , whereas Fisher and Tippett used . Von Mises (1936) identified various sufficient conditions for convergence to each of these forms, and Gnedenko (1943) established a complete generalisation. defined on the set , with parameters (location), (scale), and (shape). This is the generalised extreme value (GEV) family of distributions. If , it converges to Gumbel (type I), whereas if it corresponds to Fréchet (type II), and if it corresponds to Weibull (type III). Inference on allows choice of a particular family for a given problem. defined for and . The two parameters are the (shape) and (scale). The shape corresponds to the same parameter of the GEV, whereas the scale relates to the scale of the former as . The above is sometimes called the Picklands-Baikema-de Haan theorem or the Second Theorem of Extreme Values, and it defines another family of distributions, known as generalised Pareto distribution (GPD). It generalises an exponential distribution with parameter as , an uniform distribution in the interval when , and a Pareto distribution when . By restricting the attention to the most common case of , which represent distributions approximately exponential, parametters for the GPD can be estimated using at least three methods: maximum likelihood, moments, and probability-weighted moments. These are described in Hosking and Wallis (1987). For outside this interval, methods have been discussed elsewhere (Oliveira, 1984). The method of moments is probably the simplest, fastest and, according to Hosking and Wallis (1987) and Knijnenburg et al (2009), has good performance for the typical cases of . For a set of extreme observations, let and be respectively the sample mean and variance. The moment estimators of and are and . The accuracy of these estimates can be tested with, e.g., the Anderson-Darling goodness-of-fit test (Anderson and Darling, 1952; Choulakian and Stephens, 2001), based on the fact that, if the modelling is accurate, the p-values for the distribution should be uniformly distributed. Statistics of extremes are used in PALM as a way to accelerate permutation tests. More details to follow soon. Anderson TW, Darling DA. Asymptotic theory of certain goodness of fit criteria based on stochastic processes. Ann Math Stat. 1952;23(2):193-212. Choulakian V, Stephens MA. Goodness-of-Fit Tests for the Generalized Pareto Distribution. Technometrics. 2001;43(4):478-84. Davison AC, Huser R. Statistics of Extremes. Annu Rev Stat Its Appl. 2015;2(1):203-35. Fisher RA, Tippett LHC. Limiting forms of the frequency distribution of the largest and smallest member of a sample. Proc Camb Philol Soc. 1928;24:180-90. Gnedenko B. Sur La Distribution Limite Du Terme Maximum D’Une Serie Aleatoire. Ann Math. 1943;44(3):423-53. Gumbel E. Statistics of Extremes. Echo Point Books & Media, 1958. Hosking JRM, Wallis JR. Parameter and quantile estimation for the generalized Pareto distribution. Technometrics. 1987;29:339-49. Knijnenburg TA, Wessels LFA, Reinders MJT, Shmulevich I. Fewer permutations, more accurate P-values. Bioinformatics. 2009 Jun 15;25(12):i161-8. random sequences and processes. Springer-Verlag, New York, 1983. Oliveira JT (ed). Proceedings of the NATO Advanced Study Institute on Statistical Extremes and Applications. D. Heidel, Dordrecht, Holland, 1984. Picklands III J. Statistical inference using extreme order statistics. Ann Stat. 1975;3(1):119-31. Tippett LHC. On the extreme individuals and the range of samples taken from a normal population. Biometrika. 1925;17(3):364-87.
von Mises R. La distribution de la plus grande de n valeurs. Rev Mathématique l’Union Interbalkanique. 1936;1:141-60. The figure at the top (flood) is in public domain. This entry was posted in Statistics and tagged extreme value theory, fsl, generalised pareto distribution, PALM, permutation test, statistics, tail approximation by A. M. Winkler. Bookmark the permalink.